Necessity is not the only mother of invention; in the garden, pain is a pretty good motivator. The Homeward Bound Memorial Garden is filled with heavy clay soil. While clay soils are nutrient-rich and hold water well, they are not fun to work with. To deep weed, or turn them using a rototiller, you have to time things just right. If the soil is too wet, you will only compact it. Too dry, and it is hard as rock. Trying to time “moist, but not wet” when you are volunteering your efforts and your time is limited mainly to weekends is problematic. Thus, I have been weeding Jody’s garden by hand. Hard on the back and knees, I discovered a better way to deal with these thigh-high weeds and grasses. Someone probably “discovered” it centuries ago, but it is new to me – and maybe to you. I share it in case there are others, like me, who love the garden, but have reached a point in life where the gardens sometimes does not love me! 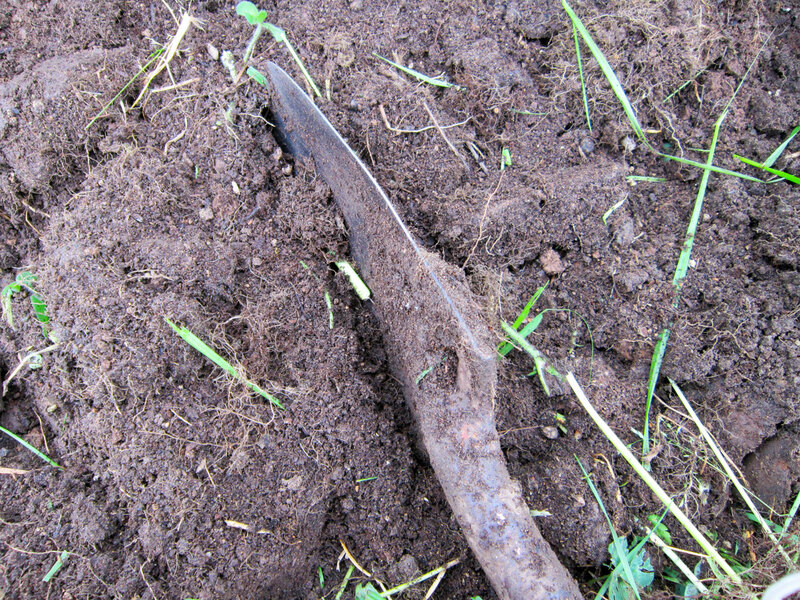 With the spade shovel, I dig across and down, cutting out big, heavy clods of long weeds and root-packed soil. To free the weeds from the soil, I place the spade shovel lengthwise in the ground with its sharp, long side edge exposed. Then I beat the weed clod against it, as if you were taking a broom to a rug. 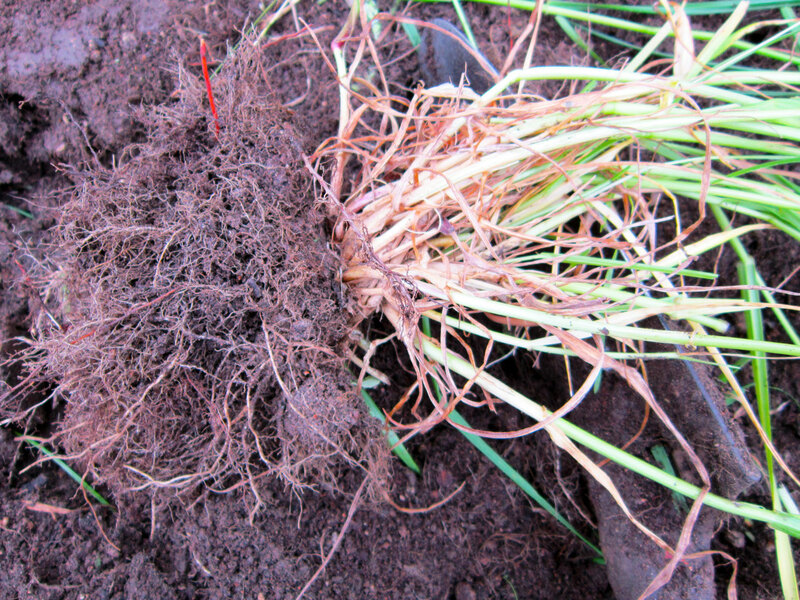 With just a couple of blows, the soil separates itself from the roots, leaving a soil-free clump that’s ready for the goat’s enjoyment. The clod gets smashed into small pieces in the process, which helps lighten the soil. Adding organic amendments and compost boosts the results. 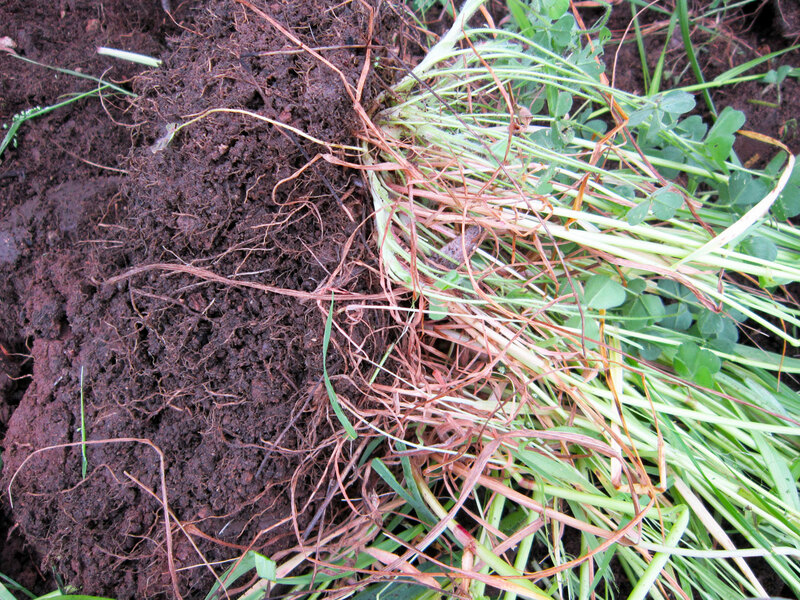 Most importantly, a thick layer of mulch is needed to keep any shaken off roots from re-sprouting. I do stacks of clods, and then attack each with the shovel technique, so the back and knees each get a breather. Finish the job with a hot shower and a glass of wine, and you’re good to go! Audrey offered her time, expertise, muscle, companionship, generosity and kindness today in helping me restore “Grandma’s Flower Garden” to its previously weeded state from fall. Flowers are in! Thank you so very much. I definitely couldn’t have done it without you. It was my pleasure! Great company definitely made quick work of those weeds. Looking forward to seeing “Grandma’s Flower Garden” take bloom!